In 1904, Hans Demant wanted to help his wife hear better and lead a more fulfilling life. He was inspired by Queen Alexandra of England, who wore a hearing aid at her coronation. This set him on a path to develop a hearing aid company in Denmark. Meeting his wife’s communication needs became the driving force behind what eventually became the Oticon brand – putting people first, supported by innovative technology. Oticon, now a part of the William Demant Holding Group has been improving people’s hearing and their lives for well over a hundred years. Oticon has a number of hearing devices that are high end technology, with the Opn range being their latest release. If you are looking for a hearing aid that will enrich your hearing and your brain’s capacity to identify speech signals, look no further than Oticon – putting people, and their hearing needs, first. Oticon has all styles of hearing aids. The following designs are available for most hearing range. Discuss with your hearing health professional what is most appropriate for your hearing needs. A custom made hearing aid, where a hearing professional takes an impression of your ear. This larger custom style is easier to handle for those with dexterity issues. Good – basic technology. This performance level will suit people who lead a sedentary life with basic hearing needs. If you have minimal communication requirements, such as watching television and conversing one-on-one in quiet, this level would be adequate for you. Better – slightly higher technology range for those who, again, have communication needs that are not complex. Best – if you have an active lifestyle, this performance level should be considered. There will be more features in the device and your hearing aid will have more dynamic functions to assist in your communication. Premium – as the name suggests, this is highest level of technology for Oticon products. For people who lead active lifestyles, enjoy many listening environments and require the best technology for challenging communication situations, this level of performance should be the one to consider. The higher the performance level, the more features you will find on the hearing aid and the more programming ability your hearing professional will have to customise your device to suit your specific needs. Some people have complex hearing needs. If you fall in to that range, higher performance levels will provide more solutions, delivering improved hearing across a wider range of settings. Think about you – what do you need to hear and communicate better? What will keep your brain and hearing sense firing on all cylinders? Oticon put people first – you should put yourself first and chose the right hearing solution for you. OpenSound Navigator – this amazing feature of the Opn range, uses the hi-tech Velox platform to keep all the listening landscape available to you. Utilising a 360° radius, this feature will give you a more open feeling, like surround sound. It copes with multiple speech and noise sources and analyses them individually. Sounds will be focused and balanced, with background noise where it should be – in the background. Speech Rescue – this technology came before the OpenSound Navigator and provides enhancements in the severe-to-profound hearing ranges. Due to damage in the ear, incomplete sounds are sent to the brain, meaning the brain may not always have enough information to interpret what is being heard. Speech Rescue aims to fill in the gaps for the brain, by transferring missing frequencies (pitches) back into the speech signal being received. This will give a clearer speech cue for the brain to hear and interpret. Speech Guard E – most people have a loss of clarity of speech sounds and a loss of loudness. Hearing aids aim to not only make sounds louder, but clearer. The Oticon Speech Guard E provides an exceptional clarity of sound. With this feature you will find speech is clear and distinct and easier to understand in background noise. IFTTT: If This Then That: – an app that will give you the ability to connect with different smart devices around your home through your hearing aid via the internet. Think about having your hearing aid set up so you can turn on your TV, activate the house alarm, or even send a voice to text message to someone through your Smartphone. There are many functions available to you with this app for Opn devices – it will keep you connected and networked to your world. Bluetooth streaming – in Opn devices, Bluetooth will allow you to stream calls directly into an iPhone, for Android phones you can use the Oticon Opn Connect Clip which allows the same streaming capabilities as the iPhone. Tinnitus SoundSupport – a common trigger of tinnitus (ringing or buzzing sounds in the ear) is stress. Sometimes hearing aids alone can help alleviate stress associated with tinnitus, but not always. All Oticon hearing aids now have access to the Tinnitus SoundSupport sound generator. You can choose from a number of sounds to help you acclimatise to your tinnitus including non-specific broadband sounds or more natural sounds such as the ocean. You can adjust the sounds discreetly using your Smartphone. The Opn, using the Velox platform, is the hearing aid that allows the speech landscape to be kept open, allowing you to hear better in background noise. With the superior features of OpenSound Navigator and Speech Guard E, you can expect outstanding performance in noisy situations. These aids can be fitted in either the RITE family, BTE styles or custom made ITE devices. All styles are suitable for mild to severe hearing ranges. 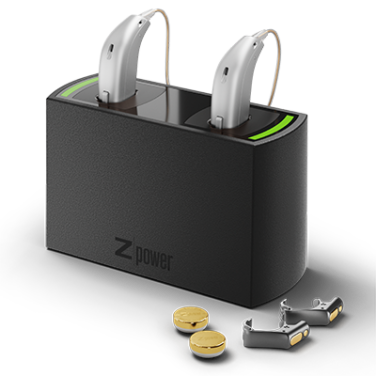 The RITE and BTE models can also now be paired with the Z power rechargeable system for the flexibility of your hearing aids being charged for 12 – 20 hours, depending on how much Bluetooth streaming you are using. Optimal level of performance for all features, with more processing channels (64) and fitting bands (16). Still a high performance model, with all the major features of the Oticon hearing aids. There are 48 processing channels and 14 fitting bands for your hearing care professional to work with. With a Level 3 OpenSound Navigator and Speech Guard, you will find 48 processing channels and 12 fitting bands in this performance level. The Opn hearing aids are for you if you want the best technology to allow you to hear and function in noisy situations. For optimal 360° hearing in even the most challenging situations, you can’t go past this device. Keeping your brain connected and in touch with sounds around you, this is an excellent choice for you if you want a high end product with proven performance in noise. The Siya hearing aid has been introduced to the Oticon family of hearing aids. It is appropriate for hearing levels up into the severe to profound range. Utilising the Velox technology, directionality and sound processing work at a whole new level. With 48 frequency channels, sound is enriched and adaptive. The Oticon Bluetooth technology gives the wearer high-quality streaming without a heavy drain on battery usage. This hearing aid will allow you to connect to your smartphone, tablet and TV effortlessly. Available in all styles and two performance levels, this powerful hearing aid has a lot to offer. If you are looking for a powerful and cost-effective hearing aid, with excellent Bluetooth capabilities and outstanding sound quality, the Siya is your answer. Following on from the performance level of the Siya, is the range of Oticon hearing devices that use the Inium Sense platform. These models all boast wireless synchronisation between hearing aids, directionality, noise management and feedback management capabilities. The Alta2 fits in to the ‘best’ performance level of hearing aids and can be fitted with all styles of hearing aids and uses Speech Rescue and Speech Guard E technology. Suitable for all hearing levels, from mild to profound hearing, the Alta2 can also be fitted with Tinnitus SoundSupport if required. If you are looking for a high level of technology and have hearing levels in the more severe range, the Alta2 would be a good option for you to consider. The Nera2 is a ‘better’ performance model and appropriate for mild to moderate hearing levels. All styles of hearing aid can be fitted with this model, including the ITC, RITE and BTE range. This hearing aid has a narrower band of frequencies to be adjusted but can include the Tinnitus SoundSupport feature if required. If your hearing needs are less complex, the Nera2 may be the type of hearing aid you are after. This will be a straightforward device for your hearing health professional to work with and adjust your hearing aid to your needs. The Ria2 is in the ‘good’ performance levels and suitable for mild to moderate hearing levels. If your communications needs are basic and you are not looking to become more active, this hearing aid model may be the right one for you. A good choice if your needs are for the TV and one-on-one conversation in quieter listening environments.